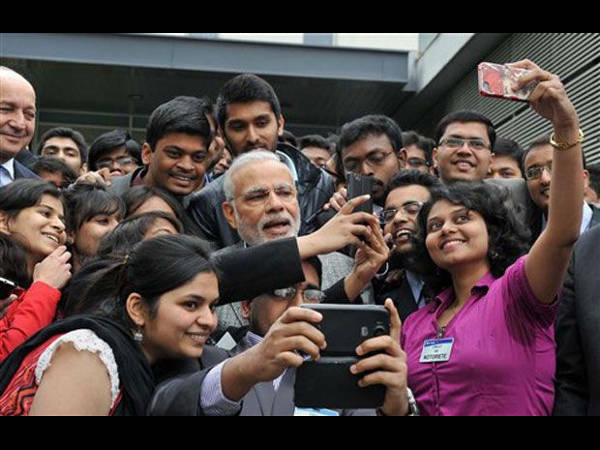 France, Apr 13: Prime Minister Narendra Modi today clicked a selfie with Indian students who gathered around him during his visit to the French Space Agency here. "Took selfies with young friends at CNES. We were all trying to take the best selfie out there," Modi tweeted on his visit to the French National Centre for Space Studies (CNES) here on the second day of his trip to France. Many students chanted "Modi, Modi" when he arrived at the space agency and assembled around the premier, who obliged them by clicking a selfie himself. "The young usually want selfies. PM @narendramodi obliges Indian students gathered at French Space Agency(CNES)," External Affairs Ministry spokesman Syed Akbaruddin tweeted. Modi, who arrived in France on Thursday on the first leg of his three-nation tour, held talks with French President Francois Hollande and met business leaders yesterday. His nine-day trip will now take him to Germany and then to Canada.